Life on Earth could have its origins in space, say Lawrence Livermore scientist Nir Goldman and University of Ontario Institute of Technology colleague Isaac Tamblyn. The pair have been simulating comet impact events and found that the extreme temperatures and pressures generated could have produced life building organic compounds – including the building blocks of proteins and nucleobases pairs of DNA and RNA. 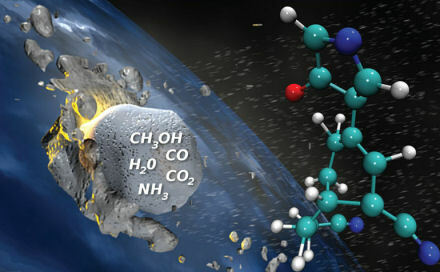 Their paper, in The Journal of Physical Chemistry A, shows how a comet impact event with a planetary surface would provide an abundant supply of energy to drive reactions of water, ammonia, methanol, and carbon dioxide in the comet. 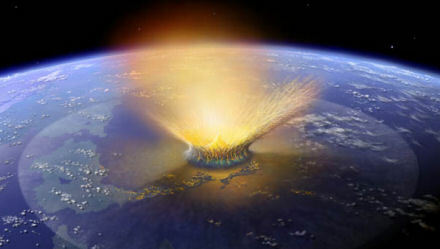 “The flux of organic matter to Earth via comets and asteroids during periods of heavy bombardment may have been as high as 10 trillion kilograms per year, delivering up to several orders of magnitude greater mass of organics than what likely pre-existed on the planet,” Goldman said. He explained that comets passing through the Earth’s atmosphere are heated externally but remain cool internally. Upon impact with the planetary surface, a shock wave is generated due to the sudden compression. Shock waves can create sudden, intense pressures and temperatures, which could affect chemical reactions within a comet before it interacts with the ambient planetary environment. 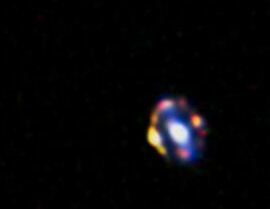 An oblique collision where an extraterrestrial icy body impacts a planetary atmosphere with a glancing blow could generate thermodynamic conditions conducive to organic synthesis. These processes, the researchers say, could result in significant concentrations of organic species being delivered to Earth. Specifically, Goldman and Tamblyn said that moderate shock pressures and temperatures (360,000 atmospheres of pressure and 4,600 degrees Fahrenheit, for example) in a carbon-dioxide-rich ice mixture produced a number of nitrogen-containing heterocycles, which dissociate to form functionalized aromatic hydrocarbons. These are thought to be prebiotic precursors to DNA and RNA base pairs. Additionally, higher shock conditions (about 500,000 atmospheres of pressure and 7,500 degrees Fahrenheit) resulted in the synthesis of methane and formaldehyde, as well as some long-chain carbon molecules. These compounds are known to act as precursors to amino acids. The paper notes that all shock compression simulations using these conditions produced significant quantities of simple carbon-nitrogen bonded compounds which are known prebiotic precursors.